I am a brownie fan all the way. I grew up baking all the cookies and bars from my Mom’s battered Joy of Cooking when I was seven. Brownies have really fascinated me ever since. Oh the chemistry of baking! And what a pleasure for an alchemist like me. The role of ingredients has always been connected to my love for exploring and my detective strike (my Mom used to say I was Sherlock Holmes because I found out everything). I found this recipe online (I apologize as I cannot recall the author and I looked all over). Pistachios are my Lebanese background touch. Being on a gluten free diet has really helped me explore new options and open new paths as adversity always does. The main thing about brownies is this: they must be chewy not like fudge, not insanely chocolaty and by no means cakey!!! And chewy they are. And yes they do need the maple syrup, I have tried everything else and it just does not do it. A note: maple syrup is a great baking sweetener and better than sugar but still high in fructose, so eat sparingly and if you are diabetic or hypoglycemic please take note: and eat a small piece and really watch what you eat every day. I can enjoy a small piece once in a while after lunch when I want a special treat but do this responsibly. And like Tony Robbins says its what you do on regular basis that counts. Grease and line the bottom of a 9" brownie pan with parchment paper. Preheat oven to 350 F. Sift oat flour, salt, cacao and tapioca. In another bowl: mix coconut butter, almond butter, maple syrup and vanilla. Add dry ingredients to wet, stir to combine with a whisk by hand. Fold in chocolate and pour batter into prepared pan. Add pistachios on top and sprinkle Maldon Salt. Bake for approximately 25 mins until toothpick comes out with fairly moist consistent crumb, but not wet. It will set as it cools. Remove and cool for at least 4 hrs cut into 9 pieces. Whatever you do don’t cut too soon these really need to rest and the texture matures. Don’t use a higher percentage chocolate as they will get too dense. Brownies keep for approximately 3 days in perfect conditions/ store in a recycled store bought salad container. Don’t refrigerate, but you can freeze them. Thank you Alex! loved your article! Thanks so much for the lovely feature and links. Thanks for baking with me! Cheers to your awesomeness! Hey Buddy!, I found this information for you: "THE BEST VEGAN BROWNIES". 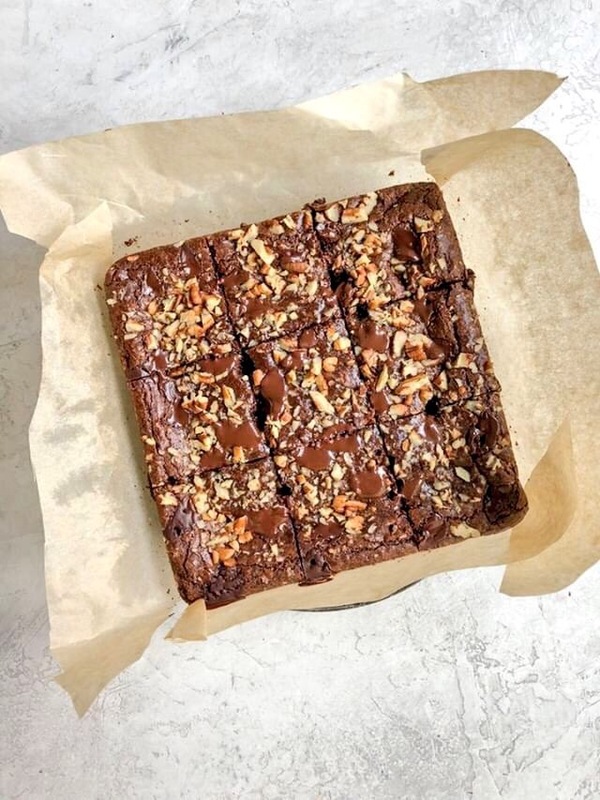 Here is the website link: https://www.vanessamusi.com/the-best-vegan-brownies/. Thank you.